The pharmacological treatment of serious psychiatric disorders is unsatisfactory for many patients. Psychotic symptoms are often only partially resolved1,2 and the cognitive and negative symptoms of schizophrenia3 and the depressive symptoms of bipolar disorder4 have proven to be especially refractory to present treatments. When confronted with poor therapeutic results, the most common response by clinicians is to try clozapine or to add another antipsychotic or mood stabilizer. All too often that still does not produce a satisfactory result, and the clinician is left wondering what to try next. For the past decade, the Stanley Medical Research Institute (SMRI) has supported treatment trials using repurposed drugs for the treatment of schizophrenia and bipolar disorder. Repurposing assumes that drugs that are already available to treat other medical conditions may be useful for these psychiatric disorders. However, because the psychiatric use is off-label, or the drugs are generic or available over-the-counter, pharmaceutical companies have little or no financial incentive to support such treatment trials. It should be recalled that chlorpromazine was discovered as a repurposed drug, having originally been used as a sedative for anesthesia. SMRI has supported approximately 200 such trials, a list of which is available at www.stanleyresearch.org, List of Awarded Treatment Trials. 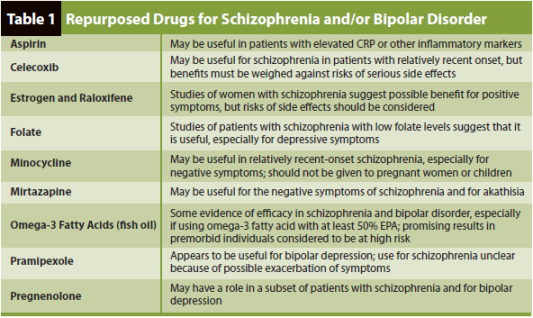 From these trials and reviews of the literature, nine medications have been identified, all of which have shown some promise for use as adjunct medication for schizophrenia and/or bipolar disorder in SMRI-funded trials. These nine medications are summarized in Table 1.